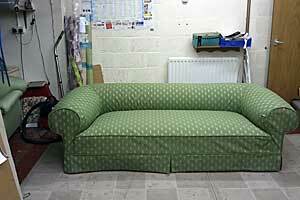 Upholstery services and Upholsterer, Upholstery and Sewing Services, Fife. 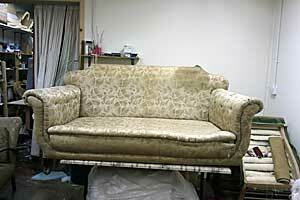 Re-upholstery and furniture restoration for commercial, home and caravan. 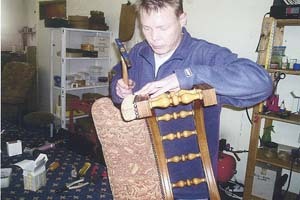 Upholsterer Mike at work at Upholstery Sewing Services, quality workmanship at affordable prices. 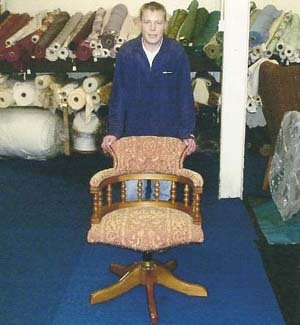 Mike has over 15 years of experience in the upholstery trade both here and in Canada. 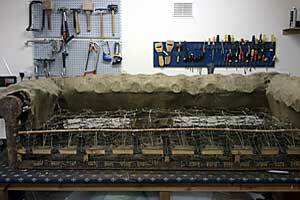 He is very competent in all aspects of traditional and modern furniture. His expertise ranges from re-upholstery of antiques, sofas, chairs and chaises and the making of headboards, foot boards, pouffes and foot stools made to order. 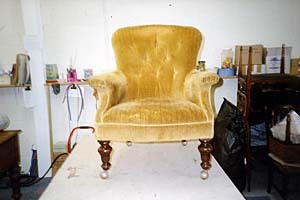 He is highly skilled in the field of antique restoration, re-upholstery, re-setting, deep buttoning and has the ability to work with horse hair. Mike at work completing a contract to re-upholster a chair. 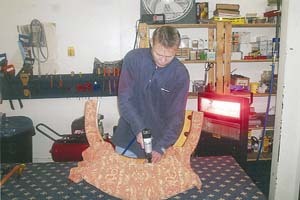 A Chesterfield being prepared for a total overhaul. 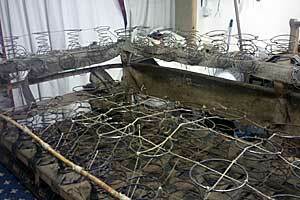 The Chesterfield nearing ready for rebuild. Nearing completion with calico lining ready for the loose covers. 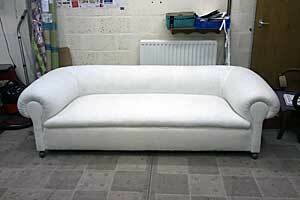 The completed Chesterfield with loose covers of the customers choice. Move your mouse over the picture for a before and after view. One of Mikes orders before and after his expertise. This sofa required a complete restoration right back to the framework with new strings and a completely reshaped and redesigned upholstered back. All covered in the customers fabric.